Susan Witt is the Executive Director of the Schumacher Center for a New Economics, which she co-founded with Robert Swann in 1980. 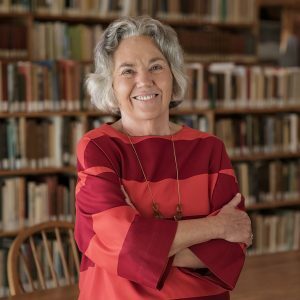 She has led the development of the Schumacher Center’s highly regarded publications, library, seminars, and other educational programs, which established the Center as a pioneering voice for an economics shaped by social and ecological principles. Deeply engaged with the history and theory of a new economics and its implications for the transformation of our relationship to land, labor, and capital, she has simultaneously worked to turn theory into practice in her home region of the Berkshires. In 1980 she incorporated the Community Land Trust in the Southern Berkshires (CLTSB) and has been responsible for many of the innovative financing and contracting methods it uses to create more affordable access to land. The Community Land Trust holds both agricultural and residential land in permanent affordable trust for the Berkshire region. In 2015 she helped incorporate the Berkshire Community Land Trust to partner with CLTSB in order to expand its reach and capacity. From 1981 to 1992 she created and administered the SHARE micro-credit program, precursor of BerkShares, and in 1985 worked with Robyn Van En to form the first Community Supported Agriculture (CSA) farm in this country at Indian Line Farm. In 2006 she co-founded the BerkShares local currency program, which has won international media attention as a model for other regions. Her talks and essays draw on stories from her practical experience. Her essays appear in Rooted in the Land, edited by William Vitek and Wes Jackson (1996); People, Land, and Community: Collected E. F. Schumacher Society Lectures, edited by Hildegarde Hannum (1997); A Forest of Voices: Conversations in Ecology, edited by Chris Anderson and Lex Runciman (2000); Environmental Activists, edited by John Mongillo (2001); The Money Changers: Currency Reform from Aristotle to E-cash, edited by David Boyle (2002); The Essential Agrarian Reader, edited by Norman Wirzberg (2003); and What We See: Advancing the Observations of Jane Jacobs, edited by Stephen Goldsmith and Lynne Elizabeth (2010). Susan Witt speaks regularly on the topic of citizen responsibility for shaping local economies, and counts Jane Jacobs as a valued mentor and important influence on her thinking. Her work has been described in various media venues. Contact Susan Witt about speaking terms and dates.